The CS231 offers the same precise temperature profiling as our CS230 SDI-12 Temperature Profiler, but with a slimmer design for easier use in borehole and road applications. The CS231 requires a smaller installation hole when compared to the CS230. For road applications, this means easier drilling, as well as less time and material to backfill. The CS231 SDI-12 Temperature Profiler uses SDI-12 digital technology for simple integration. SDI-12 does away with analog measurement inaccuracies and susceptibility to electrical noise. 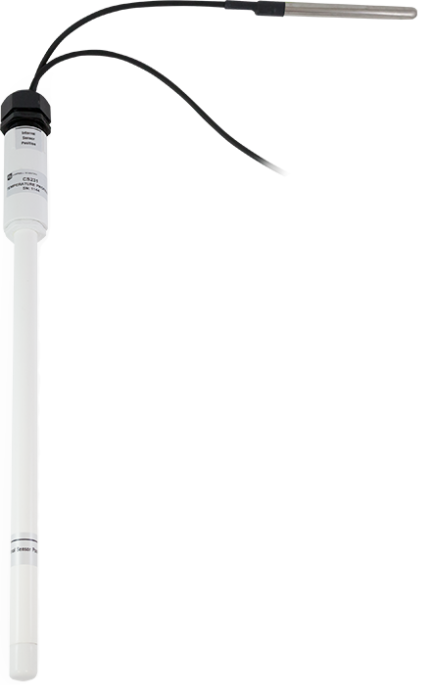 The CS231 consists of a rigid probe assembly and up to four optional external temperature probes. The rigid probe assembly maintains the precise position of the temperature points within the profile, while protecting the temperature sensors in all mediums for the long term. The CS231 is suited for a wide variety of applications and environments. The completely sealed probe assembly and external probes permit the CS231 to be used in roadbeds, soils, and water (snow and ice). Applications where the CS231 is used include spring load adjustment, frost and permafrost monitoring, soil, and water or snowpack temperature profiling. When power is supplied to the CS231 probe, the internal electronics continuously measure the temperature at an approximate rate of one measurement per second. Every output measurement obtained from the sensor is a running average of 10 consecutive one-second readings. The accuracy specification is based on an average of 10 consecutive readings. For this reason, after the initial power up, it is recommended to delay 10 seconds to obtain the best accuracy. Because the sensor is obtaining a measurement every one second, it is recommended to use the Continuous measurement command to obtain the temperature readings. Using the “R” commands will reduce the time taken to obtain a reading with the SDI-12 protocol. Our handy CS231 Configuration Tool can help you configure your profiler, and it assists our staff with customizing your profiler to your specifications. It includes parameters for lead length, first sensor from ground, and distance between sensors.